What started as a concept artist fooling around becomes reality later this month, when Fat Princess update 1.06 brings the never-ending struggle between pirates and ninjas to life. 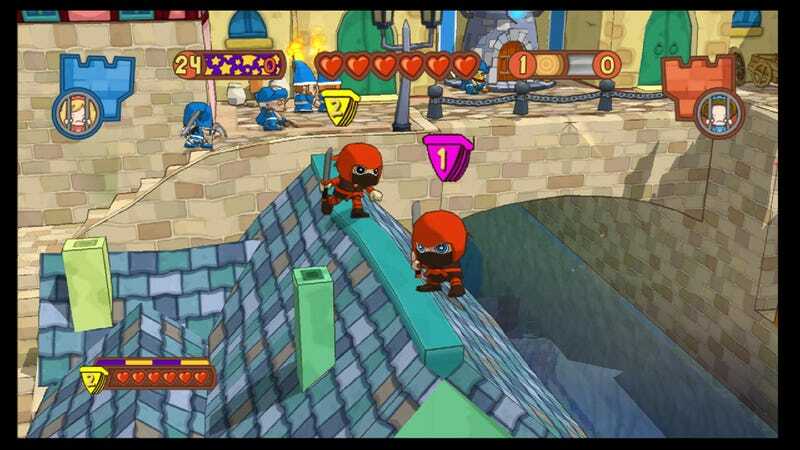 Fat Princess was never supposed to have pirates and ninjas. That's what a rep told me when I gave the new characters a spin at the Sony booth during E3 2010. A concept artist at Titan Studios thought it would be funny to post pictures of Fat Princess-styled pirates and ninjas last August. The internet picked up the image, and said concept artist will never do that again. The image caused such a stir that Atomic Operations, the team that took over development from Titan, had to bring the two characters to the game, and they'll be showing up later this month as part of the 1.06 update. Update: To Clarify, the new classes are coming in the "Fat Roles" paid expansion, while the 1.06 patch adds same-screen multiplayer for up to four players. Players who download the new content will gain access to one new hat with three different flavors - pirate, ninja, and giant. Upon donning the new chapeau, players can cycle through the three new classes before selecting one that works for them. I tried the ninja first, of course. As with most Fat Princess character types, the Ninja has a short-range attack, in this case a katana, and a long-range attack, which sends a spread of shuriken flying. He's a brutal little killer that, when powered up, can turn invisible, walking right through the enemy team's barriers as if they weren't there. I've a feeling they'll be despised by many a player once the backstabbing begins. The pirate is much more in-your-face. The cold steel of his cutlass lays into nearby foes, while his pistol is always loaded for bear to take out enemies from afar. Powered up he calls in a devastating cannon strike that decimates barriers in one blow. Finally we have the giant, a super-sized character that packs a powerful punch but has one giant weakness - he can't eat cake to heal himself. This lumbering lug has decidedly different tastes: he has to grab and eat other players to regenerate health. Ew. There's no firm date on when the content comes out, but it's definitely coming soon, according to the rep who walked me through the classes. End of this month soon. The battle lines are about to be drawn. It's time to eat or be eaten.